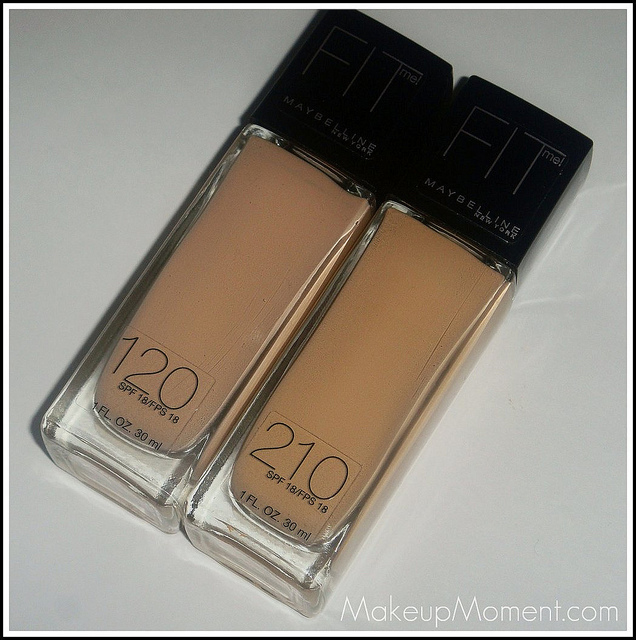 I recently reviewed the Maybelline Fit Me Concealer, and now it's time to let you all know how I feel about the Maybelline Fit Me Foundation ($7.99). I know this review is long overdue, but I really wanted to get a feel for this foundation. I have sensitive, acne prone skin, and as always with new products, I was a bit worried that it would break me out. I have been using this foundation for about 5 months now and luckily for me, I have fallen in LOVE with this foundation. So much so, that it has become one of my HG drugstore foundations. 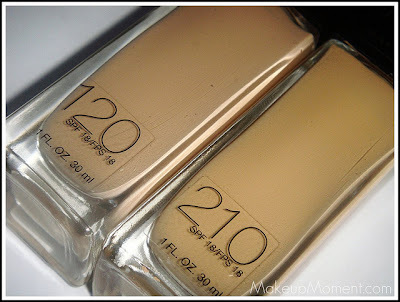 When I first purchased this foundation, I matched myself to the shade 120, Classic Ivory. It was winter then, and my skin was much more pale. So, this shade suited me best at the time. But now that the warmer weather has arrived, I realized that 120 is much too light for me to use now, in the summertime. 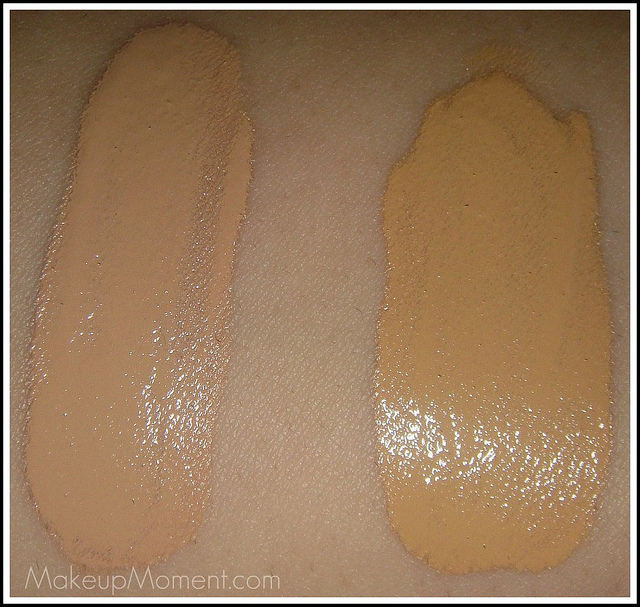 So I purchased the Fit Me foundation again, but this time in the shade 210, Sandy Beige. Shade 120 has more of a neutral tone (a little bit of both, pink and yellow mixed in) to it, while shade 210 is much more warmer and has more yellow tones in it. Although my skin primarily has yellow tones to it, I can get away with the 120 shade. If it helps, for reference, I am an NC25 in MAC foundations. 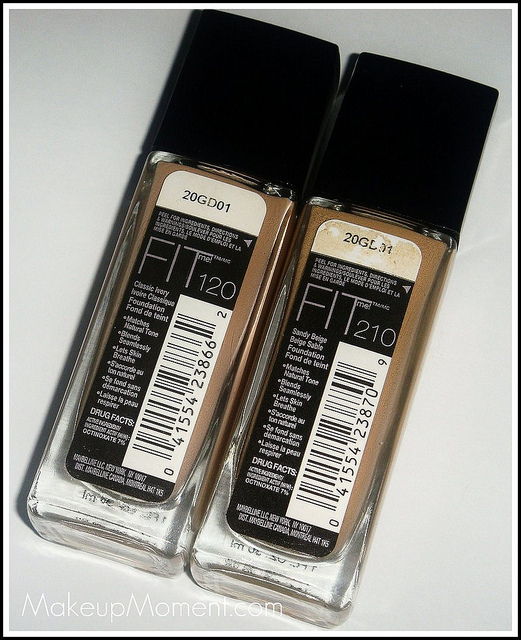 When I first saw the Maybelline Fit Me foundation display, I immediately loved the way the packaging looked. It was very sleek, and it did not look like a packaging that most drugstore foundations are carried in. I do wish though, that the foundation packaging would have contained a pump. I really am not fond of pouring out the foundation onto my hand. Sometimes I often tend to pour out more than I actually need. A pump dispenser would have been so much better because, it would allow control over how much product I want to use. I do detect a floral-like scent in this foundation. It is a bit strong-and that's surprising of me to say because, I usually don't have such a sensitive nose. But luckily, it lessens and dissipates a few minutes after I finish blending it into my skin. The foundation formula is just perfect. It's not too runny, so there is a tiny bit of thickness in the liquid, which is nice because it ensures that there will be some sort of coverage provided. I like to apply the Fit Me foundation with a stippling brush that contains synthetic fibers. I use the Sephora Professionnel Platinum Stippling brush, #44 ($35.00). It is a really great brush for applying liquid foundation, and this helps me better blend the Fit Me foundation into my skin, much better than other brushes I have tried. I love how this foundation is easy to blend, feels lightweight on my skin, and it does not accentuate any dry or flaky areas of the face. Fit Me foundation does not dry and set right away, so you do have a lot of time to work with it before it does. I do get a healthy, dewy-looking appearance on my face with Fit Me. I think this foundation is lovely for those who suffer from dry skin because it won't accentuate the dry areas, that other foundations may enhance. My skin is dry, acne-prone, and I have an oily T-Zone area. I am happy to report that this foundation has not broken me out. Score! Coverage is medium-buildable. It looks natural, and not like you have a face full of obvious foundation on. I do have acne scars-old and new, and this foundation does help blur them out a bit. But I still need to apply concealer on areas that need more coverage. As far as lasting power goes, I think it does quite well. It is not until 3-4 hours later, when I have to powder the oily areas on my face with my trusty, MAC Blot Powder ($23.00). Overall, I am in LOVE with Maybelline's latest foundation. I am really happy that there is a great drugstore foundation option out there, that won't break the bank. I definitely plan to repurchase once I finish off this bottle! What do you all think of the Maybelline Fit Me foundation? Love it? Let me know in the comments section, dolls! P.S. Did any of you go see the last Harry Potter movie this past weekend? OMG! I LOVED it!!!! I actually want to see it again this week. LOL! What did you all think of it? Disclaimer: I am not affiliated with any of the companies mentioned above. I purchased all the products mentioned above, for my personal use. This foundation looks soo good! I've been seeing many girls who have loved and used this but this line isn't sold in singapore! I think I'm the next shade classic shade...I think classic beige? If they have it in this line! I'd love to try it!